Blended artichokes are the perfect way to indulge in a creamy and satisfying snack. They provide tons of blood-sugar-stablizing fiber, magnesium, and potassium with little fat or calories. 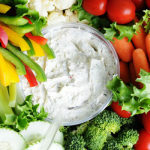 Enjoy with your favorite crunchy vegetables as a snack or at your next party.